We're gonna spend 20Gbs, I just know it. As active Habbo users know, earlier this month, Habbo came out with the crackable Diamond Gift Boxes that quickly became the highlight of November 2018. These gift boxes came at an extremely cheap price of 5 credits and 5 diamonds and featured three new diamond head accessories: the Diamond Leaf Crown, the Diamond Noble Crown, and the Diamond Fish Hat. But November isn't over yet! 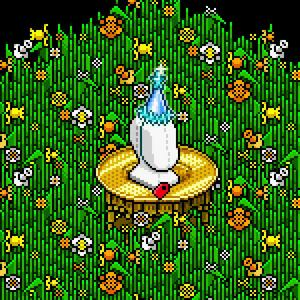 Habbo recently announced the coming of the new Diamond Party Hat, stating "They're rare and will never be sold again". That's right folks, once they're out, grab one while you can! Unless you're like me and can only sit and wait for a kind soul to host a giveaway. ﻿With that being said, keep your eyes out for an offer on the hat this Black Friday! By the extravagant looks of the hat, you don't want to miss out on it. totally off topic but i love ur way of reporting ari!!! I hope the star lights up! I kind of want this!